The Check-in kiosk is the most popular of all kiosk and self-service models. It comes in the widest possible range of formats from your mobile phone to a small tablet to conventional self-service terminals to large format self-service terminals. They are indoor and they are outdoor. Are you checking out a bike rental kiosk? That’s checking in. Ticketing kiosk applications — You pick up your tickets or you purchase your tickets. Airline Check-in — one of the earliest applications and now expanded to Trusted Traveler, CLEAR and other services. Baggage dropoff and pickup — now Airlines are using check-in kiosks for these functions. 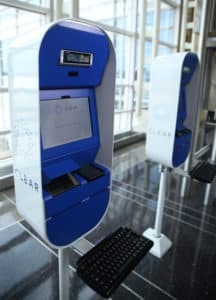 Olea Kiosks have been used for over 5,000,000 airport check-in’s. Put our experience to work for you. Olea Kiosks has been in the business for almost 50 years beginning with tradeshow exhibits. Experts in ADA compliance, HIPAA compliance, biometrics, authentication, ticketing and EMV, Olea is uniquely qualified to be your self-service partner, with the experience to back it up.